We always value feedback from all of our students and here is what some of our students thought of us. 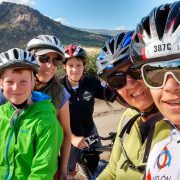 Spanish in Nature offers more than simply a well-crafted linguistic immersion program, it opens the door to the daily life of a Spanish family with real people willing to share a little bit of their intimacy. The experience engages us, the guests, not only at the intellectual level, but also at a deeper level. I was constantly invited to react, respond and share, which led to a rapid increase in fluency. From the start, it is obvious that Esther and Alvaro have put a lot of thought and dedication into the program. All the elements are there to create the perfect experience – the nearby mountain range for hiking, a beautiful home with comfortable rooms, the well-appointed classroom, the delicious food eaten with the family, the well-planned activities, the easy pick-up and drop-off at the airport, etc. With Alvaro and Laura as teachers, I was able to focus on my specific needs, deepening my understanding of the Spanish grammar and my grasp of the language. Both are excellent teachers who used various tools to make learning enjoyable – from cards to songs to comedy skits. My fluency in Spanish increased tremendously in a week. In fact, shortly after the course, I was able to conduct a 10 minute telephone conversation with a native Spanish speaker I did not know, almost seamlessly. Spending a week at the home of Esther and Alvaro was one of the highlights of the year. To put my review in context I am a 34 year old man, working in finance in London. 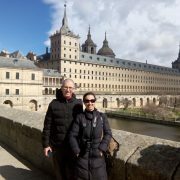 Prior to staying with Spanish in Nature (Esther & Alvaro) I was studying on an evening course twice a week in London and had just completed 60 hours of classroom lessons at the time I flew out to them (October 2018). 60 hours sounds like a lot but for me it was just enough to have some very very basic knowledge of Spanish with very little spoke. Spanish. Being an older student I was a bit nervous about what to expect. Having returned a couple of weeks ago I can honestly say that it was one of the best experiences of my life not only for learning the language but also to have spent time with an amazing family and to have also learnt about Spanish culture and been able to experience different afternoons out in places I never would have seen in my life. From the moment you arrive every second is in Spanish. Being pretty new to the language it probably took my brain a day or two to start fully absorbing the words and phrases and to start committing them to memory. However you soon find yourself keen to speak and ask questions and have normal every day conversations that you’re never going to get in a classroom. My studying was tailored to my level of Spanish and I felt like the pace and the things that I learned were just the right amount for me. My tutor Alícia came to the house every morning for a few hours and we had classroom based lessons. She’s an excellent teacher and knows just how to structure the lessons to your specific level, I was very impressed. After the lesson I would then do a quick bit of homework, then we’d sit down for lunch and talk in Spanish about every day things. After lunch for the afternoon I was then fortunate to go hiking with Alvaro and/or Esther, into Madrid to see the city, or to go see flamenco or into Segovia. The days flew by and I was genuinely very sad to leave them after a week as very much felt part of their family, they are wonderful people and their children also engage with you over dinner to help you learn. The one regret for me is that I only stayed for one week. I think to really accelerate your learning, two weeks minimum is better as when you return you find yourself anderting questions in Spanish or just wanting to speak it every second. I can’t recommend Spanish in Nature enough, they are excellent and I’m hoping to return next year to learn more and spend time with them all! If anyone had any questions I’m happy if you want to reach out to me but I promise you will not be disappointed. I spent 4 days with Esther and her family earlier this month. I went with a few others from our Spanish night school class that I attend in England. I was not sure what to expect, a little nervous that I might find myself out of my depth. I can honestly say that it was such an amazing experience. 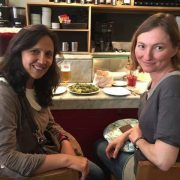 From the moment we met Esther at the airport I felt so welcome and the learning began immediately.They live in a beautiful part of Spain, with breath taking views even from their garden. 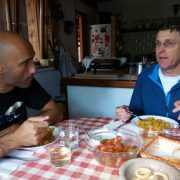 I learnt a lot of Spanish, spoke a lot Spanish and ate a lot of Esther’s wonderful home cooking. Nothing was too much trouble. 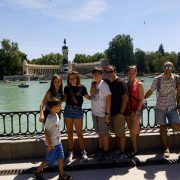 The whole family were so patient and took great care to ensure that we visited some lovely places and had lots of opportunities to speak Spanish. To be honest, it was just what I needed in order to move my learning on. Being taken away from daily concerns and just being able to concentrate on speaking and learning Spanish was invaluable. I can thoroughly recommend a stay with Spanish in Nature. I would go back tomorrow. A truly excellent experience. Esther and her family are so kind and welcoming. The days were filled from beginning to end with activity. Walking in the forests, visits to towns, castles, palaces and a microbrewery. All the visits were guided by either Esther or Alvaro who, both, provided a wealth of detail about all we saw. All meals were freshly prepared Spanish food and extremely delicious and healthy. Everything was conducted in Spanish. All at a level and pace that was understandable. If English was required to assist with explanation, then this was done, before returning to Spanish. I only have a basic level of Spanish and at no point was I allowed to feel out of my depth. 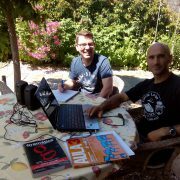 Using Spanish all the time felt very natural in this environment and learning style. I have recently returned from a four day visit to Spanish in Nature. I attended with a small group of other students with whom I am studying Spanish. I cannot speak highly enough of my visit and of Esther and Alvaro and their lovely children. 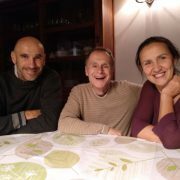 Esther and Alvaro are very warm and genuine people for whom nothing is too much trouble. I do not think I have ever been made to feel more welcome in another person’s home. They have a lovely house which is situated in a perfect location with a beautiful view of the Sierra de Guadarrama mountains. 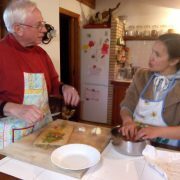 They fed us extremely well and introduced us to typical Spanish foods as well as finding interesting trips to take us on including Segovia and the beautiful National Park which is close by. Not only has my Spanish improved as a result of my visit but I feel that I have experienced a true introduction to the Spanish way of life. There is only one word needed to describe my visit, perfect! I cannot recommend Spanish in Nature highly enough. Thank you Esther and Alvaro for a wonderful few days. 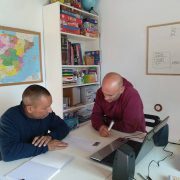 I have stayed a week at Esther and Alvaro’s place for Spanish lessons. They are lovely, easy going people with three great children. A family where you feel at home right away. They cook great spanish food and conversations take place around the kitchen table. I had three hours of private lessons a day, of great quality. It is possible to focus on the things you want to improve. The surroudings of the house are beautifull and perfectly suited for outdoor activities (we did great hikes and a mountainbike tour). In short, a great combination of learning and having fun! 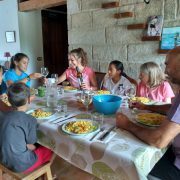 Une famille très accueillante, qui cherche à faire découvrir la culture espagnole par des activités variées ( visites, excursions, activités sportives, spécialités culinaires…). Les cours sont donnés tous les jours le matin par la famille ou des enseignants extérieurs. Une façon d’apprendre ludique et enrichissante. La famille est très disponible et la vie avec eux est très sympathique et chaleureuse. Je recommande particulièrement SPANISH IN NATURE. Maud de FournasFrench. 17 years old. 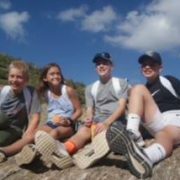 Our sons had an incredible, 2-week experience with Spanish in Nature. They came away with a much deeper appreciation of Spanish culture as well as much greater fluency in the language. 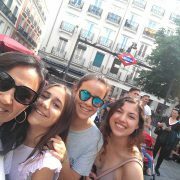 When we spent a couple of days in Madrid after their stay with their host families outside Madrid, our sons received such nice compliments about how well they spoke the language. Choosing this program made all the difference in making the experience fun. 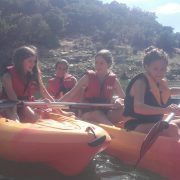 Our sons got to go on exciting excursions such as kayaking and hiking. 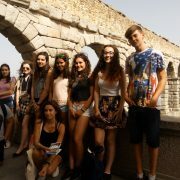 They also went to Madrid and Segovia for enriching cultural activities. The most important aspect was sharing these experiences with their host families, which really helped them learn and appreciate the culture. This element is so critically important because it makes the language come alive and become a part of them. Without reservation, we advise anyone to participate in Spanish in Nature. It offers a wonderful balance of language instruction, cultural immersion, and fun activities with host families and other children. All in all, an incredible experience for our kids. Spanish in Nature is an absolutely incredible program. Our kids went for 2 weeks this July and are literally begging to return. They each loved their host families and the experience of really learning the culture. The Spanish classes were great and they were ability grouped so they could progress at their appropriate levels. When they came back to the US to start school they were given Spanish assessment tests and nearly passed out of a whole year from their learning and practice while in Spain. They really got to practice their Spanish daily during the camp activities with all the kids and everything was so memorable. We have told so many people about our experience I need to get signed up ASAP for next year before the spots are all taken. I highly recommend the program and Ms Esther Campos Pizarro makes it so easy by getting them upon arrival and communicating with photos of their days so we could see how happy they were. I am so happy I found the program, best part of my kids summer by far! My son went for the first time in the summer of 2018 and now he is going back for February Half term. He had so much fun and learnt so much, this trip made him grow and develop in more ways than just learning a language. Easter and Anna the host family were wonderful and kept me up to date with my sons progress and his general mood. I was very impressed and felt very proud of my son. this program helps them not just to learn a managed but to understand it and the culture behind it. My son made many friends around the world and felt like he truly had a second home while there and still talks about his host family today as they meant so much to him. I couldn’t be more thankful to them all for making my sons experience one to remember. I would highly recommend this school and will continue to send my son in future years. 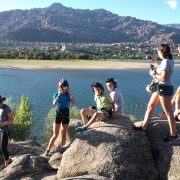 My son Thomas had an incredible experience at Spanish in nature this summer!!! He came back loving all things Spanish and having thoroughly enjoyed his host family, Esther and her husband, the morning classes, the water sports activities,the hikes through beautiful nature, the delicious food, the relaxed atmosphere … first thing he said when he got home is “can I go back next year?”! Truly fantastic language summer camp, as a mum letting my 12 year old go abroad alone for the first time I felt he was in good caring safe hands. Thank you Esther!!! Clothilde was very happy to discover spanish with friends from many country. She can learn more than 2 years of school, can appreciate spanish culture. Recomendamos este viaje a todos nuestros amigos. Gracias Esther, Alvaro, Lucía y Javier. 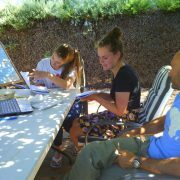 I have recently spent two weeks studying Spanish with my daughters (aged 13 and 7) at “Spanish in Nature,” the family-run language school at the foot of the mountains outside Madrid. Having come across this school on the Internet last year, I did not know what to expect. It was a wonderful experience. Not only are Alvaro and Esther, the school’s founders and its principal teachers, competent and professional, but also welcoming and generous. From the moment we arrived we felt part of their family. Classes took place in the mornings in the well-equipped “aula” in the family home. Alvaro diligently prepared each class, effectively alternating tough grammar drills with interesting lessons on Spanish and Latin American literature, cinema and current affairs. Esther was the warmest and most loving teacher to my youngest daughter, who was at her very first experience with formal training in a foreign language. The afternoons were dedicated to excursions and visits. El Boalo, the small town where the school is based, is blessed with cool temperatures and a great location, less than one hour away from terrific mountain hikes in the Sierra de Guadarrama and the major sites of Madrid and its museums and parks, the Escorial palace, the Valle de los Caidos, etc. Beautifully preserved historical towns of Avila, Toledo and Segovia are also close by. I would be seriously remiss not to mention the cuisine. Esther is a fantastic cook and we got treated to an ever changing variety of gazpachos and salmorejos, paellas, asados, pistos, tortillas, croquettes, barbecoas, and more. A great feast indeed. Most of all, it was our hosts’ warmth and generosity that made our time in Spain so precious. We are grateful to Esther and Alvaro for a great time, and very much look forward to returning to “Spanish in Nature” next year. I would highly recommend this program for anyone looking for an authentic experience of life in Spain! Not only is the house in a gorgeous location at the edge of a national park, but the Campos family are some of the kindest, most accommodating individuals I have ever met. I cannot speak highly enough of the living situation, the food, the tours of Madrid, and the Spanish classes they offer at their house. There is no shortage of activities to do and the family makes sure the the guest has the opportunity to get to know the area and it’s culture with the host’s guidance. It is the experience of a lifetime, don’t miss out!! I cannot recommend the school highly enough. In one week I learned more than several weeks on a standard language course. Everyone in the family is warm, friendly and helpful. Immediately you are made to feel welcome and at ease . All your interests and tastes are carefully catered for, from the food you eat, to your lesson plans, to your daily timetable. Anyone with any doubts or reservations will feel immediately reassured: they genuinely want you to have a wonderful experience. The only downside is that I would have loved to have stayed longer! William our 12 year old boy had a fantastic time time this easter . He as far from thrill to go to start with but loved everything , the family, the activities, the food and even the teaching. It was a perfect experience in all aspects. My experience with the Spanish in Nature course was amazing. My goal was to be able to improve my Spanish while also being able to experience a different culture. This course allowed me to fulfill both of my goals. The daily Spanish classes really helped my grammatical proficiency and through out the day the Spanish immersion allowed me to improve significantly my conversation skills. 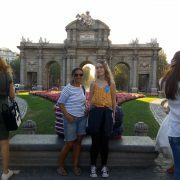 I was able to learn about the Spanish culture first hand and visit many of beautiful monuments, historical sites, and cathedrals in Madrid and the surrounding areas. The food was great and the accommodations were wonderful. My week with Spanish in Nature was the best use of my spring break. Muchas gracias por todo.Estaba muy feliz.Recomiendo a todos los,que quieran aprender español.La familia encantadora te dará la bienvenida y te sentirás como en su casa. From the time I was collected at the airport by Esther, she was very warm and friendly. When I arrived at her house I was also greeted by the same warmth from her husband Alvaro and children. The food was absolutely delicious, the children were as friendly as the parents. For me the experience was amazing. And so genuine and natural. I don’t have a favourite part because I liked it all from sitting in the garden without the hustle and bustle of the city and all the different places we visited. Esther was very accommodating by always giving me choices of what and where I wanted to go and do. I will definitely be revisiting next summer, with my son next time. My Spanish has improved tenfold and I am now much more confident in speaking it. 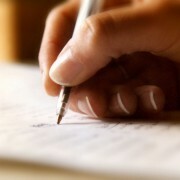 We are mature students who have attended, over many years, Spanish language courses both in Spain and here in the UK. 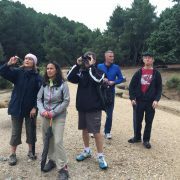 During September 2017 we had a one week total immersion experience at “Spanish in Nature” – situated within the lovely Guardarrama National Park not far from Madrid. The school provided transport to/from the airport as well as daily, after school, visits to places of interest that we thoroughly enjoyed. 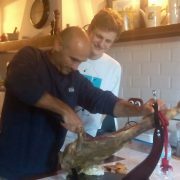 At “Spanish in Nature” – the impressive high standard not only of teaching but: the accommodation, tasty meals and all-round attention to detail far exceeded our expectations. Most importantly our language proficiency increased immeasurably. 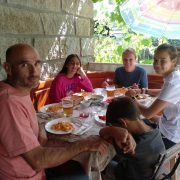 All this leaves us with no hesitation in recommending a stay with: Alvaro, Esther and family at “Spanish in Nature” – you will not be disappointed. 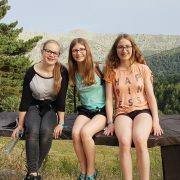 I spent two weeks at the camp with my sister in separate host families and had a memorable time there. In the afternoon we conducted a lot of activities as Spanish class. It was very bonding when our host families joined. I hope to come back next year. 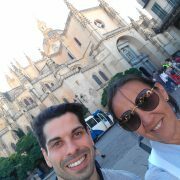 During the time of two weeks I had a wonderful opportunity to expand my Spanish skills and learn about Spanish culture. I felt welcome in my host family and felt that I could ask them when I needed help. I really enjoyed the two weeks in Spain. Thank you for everything, Esther. Darcy very happy and talkative. She enjoyed the 2weeks a lot and wants to return next year. Well done!!! 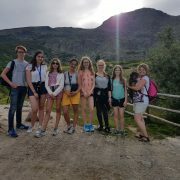 Our 14 year old daughter traveled to Spanish in Nature this summer and had a wonderful experience. It was the perfect setting for her, and that is why we chose it over the many other language programs abroad. It is small and intimate. Esther and Alvaro are warm and caring, and that immediately comes through when you skype with them. You know right away your kid will be safe. 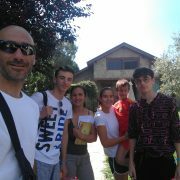 Our daughter was one of 6 kids, all teens from different countries, who went to spend 1-2 weeks there. They broke into groups (according to their proficiency with Spanish) in the mornings and then later in the day did fun outdoor excursions. Each kid lives with a host family, who are well known to Esther and Alvaro. Not only do the kids interact with the other teens during the day but also with Esther and Alvaro’s 3 kids, and the host family’s kids too. Our daughter is on the shy reserved side, but this camp was loving and safe, the perfect choice. I only wish we had sent her for longer! Si pudiera subiría a un avión ahora mismo para pasar otra semana con Esther, Alvaro y sus hijos. Mi estancia con ellos me hizo crecer a nivel profesional (profesora de español en secundaria, Bostón) y personal. Las clases con Alvaro me ayudaron a mejorar mis destrezas lingüísticas y resolver algunas dudas del idioma que tenía. Además, aprendí unos métodos de enseñanza y actividades nuevas que ya he usado en mis propias clases con mucho éxito. Yo estaba buscando un programa que me ayudase a ser una maestra mejor y lo encontré. Pero lo que hace que este programa sea único es la oportunidad de vivir con y conocer a esta familia. Me encantaron las excursiones que hicimos a la montaña e incluso a la carnicería. Y lo que más me gustó, los momentos juntos que solo tienes cuando pasas mucho tiempo con alguien, cuando te mueres de risa por algo o cuando una conversación llega a ser más profunda y conoces mejor a alguien. Esa semana siempre será una experiencia significativa en mi vida. ¡¡Y espero regresar algún día!! Our family had an amazing week with Esther, Alvaro and their family! 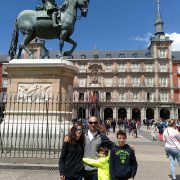 My children (ages 4, 6 and 10) acquired language, learned about the Spanish culture, made friends and had fun! Our experience with Spanish in Nature has my kids very interested in learning more Spanish, and they are insisting I speak Spanish with them at home. I had a great week of classes with Alvaro. His lessons were perfectly suited to my needs as a language learner, and his methods kept me interested and engaged. Esther and Alvaro made us feel so welcome in their home, and our time with them was our best travel experience yet! Wonderful experience. 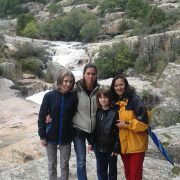 Both Alvaro, Esther, and their children could not have been friendlier, or more patient with our Spanish learning. Our family is mixed in our spanish speaking abilities with our teenagers already being well advanced over my wife and I. They handled this perfectly and adjusted both classes and conversations towards our respective levels. Our living area and their house was so clean, roomy, and comfortable!! We previously did a home-stay in Costa Rica and although we loved Costa Rica, Spanish in Nature exceeded all expectations and was significantly better for practicing/learning spanish. A big reason is class doesn’t end with the classroom session but continues during all meals and past-times. The family took us on excursions to museums, castles, and ancient Roman towns you would not normally see on a trip to Madrid. 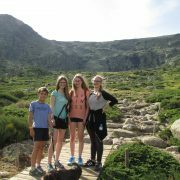 They took us on mountain hikes, one of their favorite pastimes, but more importantly, they used every excursion as an opportunity to teach spanish from the different words you learn in class to just basic conversations while on a hike. Their cooking is fabulous and love of their own country and desire to show it to you is contagious. My kids enjoyed every single day there; so much they literally want to move there. My teenagers attended Lucia’s (their oldest daughter) school one day, we went out one night for drinks and a live band downtown in the small town they live near. We begrudgingly left for Barcelona for the remainder of our holiday. We honestly feel like we left friends that we hope to keep for a long-long time and if anyone in their family comes to the US, we would love to host them. Gedurende twee weken woonde ik bij Esther en Álvaro en hun drie kinderen in hun mooie huis met tuin en zwembad. Doordeweeks kreeg ik drie uur per dag afwisselende en interessante lessen van Álvaro. Met hem bezocht ik een mooi kasteel. Met Esther maakte ik veel culturele uitstapjes naar musea. Verder trokken we de prachtige, bergachtige natuur in. Door het intensieve en prettige contact met het gezin, kreeg ik de kans heel veel in het Spaans te converseren. Een echte aanrader voor wie zijn Spaans op een leuke en snelle manier wil verbeteren. Bovendien bieden zij voor iedereen programma’s op maat aan, bv. met golfen of andere activiteiten. Having studied Spanish on and off for many years, I have always been disappointed in my progress because of lack of meaningful conversation practice. You just don’t get this when your main contacts are waiters, hotel staff and shopkeepers, and conversations in lessons in the UK always seem quite artificial ! I found that a week’s stay with Spanish in Nature ,speaking only Spanish, gets over these problems,and I improved my vocabulary and gained confidence. Any previous fears I had about undertaking a week of only speaking Spanish were dispelled on the first day. Esther, Alvaro and their family were very patient with me, and if I didn’t understand the first time we found Spanish words that got me there in the end. It was nice to be able to have normal conversations in Spanish about everyday subjects. 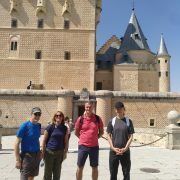 The right balance was struck between between formal lessons and excursions into the countryside, to Madrid, Segovia and other historic towns. I also managed a half day skiing and scrabbled up rocks in the beautiful National Park to view vultures, eagles and mountain goats ! 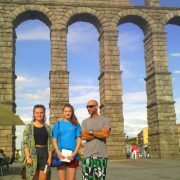 It was a great balance between learning and speaking Spanish and having a holiday in a region of Spain you would not normally visit. I can thoroughly recommend a stay with Spanish in Nature. Soy profesora de español como lengua extranjera en Suecia. Como el español no es mi lengua materna es muy importante para mí buscar las posibilidades para practicarlo, ampliar mi vocabulario y encontrar inspiración para poder motivar a mis alumnos. Ya durante mi primera experiencia en la casa de Esther y Álvaro entendí que era un sitio dónde iba a poder desarrollarme como profesora. Las clases con Álvaro me recordaban el tiempo de mis estudios cuando podía discutir las cuestiones lingüísticas de una manera profunda y detallada con un profesor competente y comprometido. Los temas de las clases eran muy variados. Hablamos del cine, de la música, de la literatura y de la sociedad. Había temas clásicos y actuales. Nunca olvidaré las clases que trataban del sentido del humor y durante las que vimos actuar a los humoristas españoles más populares. Me estaba muriendo de risa. Los métodos y el material que Álvaro utilizaba durante las clases me inspiraron y me dieron ideas nuevas que luego podía usar durante mis propias clases con mis alumnos, de repente muy animados para estudiar más. Lo que ha gustado mucho a mis alumnos era también que por fin podía cantarles cosas que no suelen leer en sus libros de español. Cosas cotidianas que se ve y que se aprende sólo cuando se participa en la vida de una familia española. 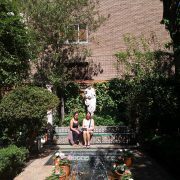 ¡Muchas gracias, Esther y Álvaro, para su hospitalidad durante mis cuatro estancias en su casa! This year’s winter holidays were exceptional – my children and I spent one week in a friendly and welcoming atmosphere at Esther´s and Alvaro´s. Since I had the pleasure of visiting them before, I knew that they would try their best to make us feel at home with them. Meanwhile, I didn’t know how my six and nine-year old children would react to the Spanish food, foreign language, and an environment to which they aren’t accustomed. However, when we came into their house these fears disappeared, and I was completely calm. 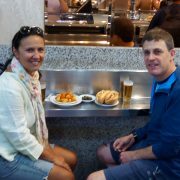 From the first meal they really enjoyed the food and they were pleasantly surprised. After that the children disappeared to find out about the new surroundings and play with Javier, Amor and Lucía. Each day gave us many new experiences: lots of different games and activities, preparation of meals, horseback riding, a visit to the fire brigade, trips to the mountains and to the centre of Madrid, a visit to an unusual museum dedicated to the mouse “Perez”, breakfast bar tasting “churros con chocolate” and finally an unforgettable visit to the Spanish school, where children spent the morning attending classes with Javier and with a nice and friendly school staff. Learning Spanish whilst hiking in the mountains, playing golf, playing padel, going for beers, doing the sights was perfect for me. Esther, Alvaro and their children made me feel very at home and they made a big effort to adapt the programme to me and my interests. A great way to improve your Spanish and have fun at the same time. 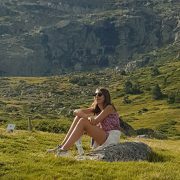 Como profesor de español para extranjeros no nativo en UK, lo que buscaba de mi estancia con Esther y su familia era la confianza paraestar enfrente de mi primer clase con alumnos, sabiendo que podría hablar con bastante fluidez. No quedé decepcionado. Desde el primer momento Esther me habló y me hizo muchas preguntas, así que fue inevitable que mi fluidez y confianza creciera cada día. Me encontraba muy bien en la familia y Esther y su marido Alvaro hicieron esfuerzos para adaptar el programa a mis intereses y mis necesidades. Otra ventaja de esta estancia fue el aprendizaje de las expresiones informales que suelen utilizarse habitualmente en las conversaciones reales y que no encontrarás en los libros de texto. A mis alumnos les gusta aprender estas expresiones. Además aprendí mucho más de la cultura española y por eso puedo introducir estos aspectos en mis clases – algo que no habría sido posible sin esta experiencia tan inolvidable. Ahora estoy planeando llevar un grupo de mis propios alumnos, para que ellos también puedan aprovechar esta oportunidad. I spent a highly memorable week being fully immersed in Spanish culture, thanks to Spanish In Nature. 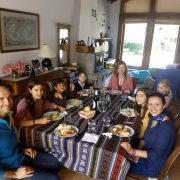 I felt welcome from the outset, meeting Esther, Alvaro and their three children, who accommodated me, my interests, and tailored my Spanish experience. They even surprised me with a little Spanish celebration for my birthday, cake and all! The lessons in the mornings were always interesting and challenging, with the use of music and videos – I always learnt something new and surprising, both about the language and the culture. Each afternoon was a chance to explore another aspect of Madrid and the surrounding areas, and I particularly enjoyed the hiking in Guadarrama National Park, with some absolutely stunning views. 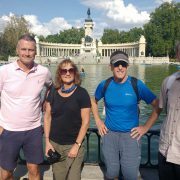 The week was busy and varied, but with many opportunities to relax and enjoy the landscape and culture of El Boalo and Madrid. It was great to see the real Spain, and not just the tourist attractions, making it feel like I had a more authentic experience. They encouraged me to practise speaking in Spanish throughout, so much so that I even found myself thinking in the language. I don’t think I spoke English at all until I returned home. For me this was a really fun, rewarding and memorable experience, and it has improved my confidence, both in Spanish and in general. It has definitely inspired me to plan my next trip to España. 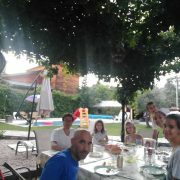 My husband, daughter and I had an amazing week staying with Alvaro and Esther and their three lovely children in August. It exceeded all expectations. As any family would be, we were really apprehensive, before we went, wondering and worrying about what it would be like to stay with complete strangers in their home but our worries vanished instantly on arrival because we were made to feel so welcome and by the end of the week, we felt that we had known the family for years. No family could be more friendly and hospitable. The purpose of our visit was for our 12 year old daughter to improve her Spanish beyond the little she had done in a term and a half in her first year at senior school. She had a three hour formal lesson each day, being one-to-one tuition with Alvaro and she thoroughly enjoyed her lessons. We went on some really interesting trips during our week, including spending a day exploring Madrid. 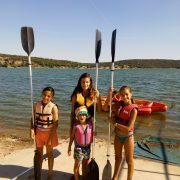 Our daughter enjoyed rock climbing with Alvaro and Lucia, his elder daughter and canoeing with all the family. Our first meal soon after arrival was a lovely lunch of paella, cooked outside by Alvaro and all the meals in the week were mouth-wateringly delicious. 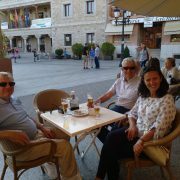 The weather was fantastic and we really enjoyed the Spanish way of life with the afternoon siesta out of the heat of the day and lovely after dinner chats late into the evening. The house was situated in beautiful surroundings and it was all so peaceful. It really was a most idyllic week and one we very much hope to repeat. The worst part of the week was saying goodbye at the end and we were so sad to leave. 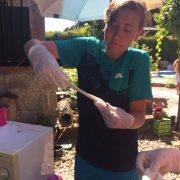 Mon fils de 15 ans a découvert l espagnol grâce a Spanish In Nature. Le mélange de cours, d intégration dans une famille très bien choisie, d un encadrement attentif et toujours disponible, et de sport dans un lieu très nature, a été un merveilleux facteur déclencheur pour notre fils. Cet organisme mérite d être mieux connu ! Muchas gracias por una semana muy buena en julio 2016. Me encantó todo, las clases, la comida, la casa y el tiempo. Me gustó mucho todas las actividades después de las clases ¡me encantó montar a caballo!. ¡Sois una familia fantástica!. Mi español es más bueno gracias a vosotros. Espero que mis clases de español en la escuela y mis exámenes sean muy buenas. 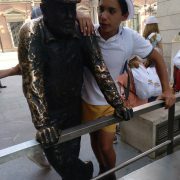 The two weeks I spent in Spain are among the most memorable of my life. 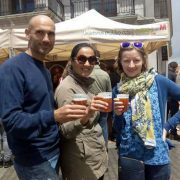 The program offers a unique opportunity to learn Spanish in a one on one classroom setting as well as by immersion, all the while experiencing Spain`s unique culture, attractions, histories and food. Les deux semaines que j’ai passé en Espagne sont parmi les plus mémorables de ma vie. 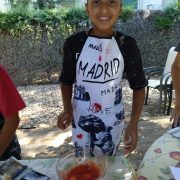 Ce stage offre l’opportunité unique d’apprendre l’espagnol non seulement dans le format d’un cours particulier avec un professeur mais aussi en immersion dans le langage, aussi bien que dans la culture, les attractions, l’histoire et bien sûr la nourriture espagnol. La famille est très gentille et accommodant, la communauté hospitalier et l’environnement simplement à couper le souffle! Sans parler de la ville de Madrid, où on peut passer plusieurs journées. Ma plus grande plainte, c’est de ne pas pourvoir y rester plus longtemps! D. Marsaly16 years old. American and French. 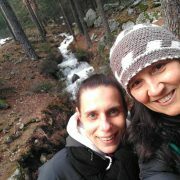 Al final de mayo estuve en El Boalo, en el corazón del Parque Natural del Guadarrama, para hacer un curso de inmersión “Español en la naturaleza”. Pasé una experiencia muy única, porque la familia era fenomenal. Me trataron como si fuera de su familia, me cocinaron riquísimo y tradicional de España y me dedicaron un montón de tiempo de calidad. Con la variedad de las actividades, por ejemplo: participación en la vida de la familia, en los eventos locales; senderismo, ciclismo, escalar, nadar, visitar Madrid y Segovia etc. fue imposible aburrirse. La combinación de este entretenimiento con hablar solo español, para mí, fue la mejor manera para aprender el idioma. Aparte de inmersión total, tenía tres horas de clases formales cada día. Estoy muy sorprendida como he mejorado mi nivel de español, solo durante una semana – ahora tengo mucha más confianza de hablar en español, sin ayuda de inglés. Esther, Álvaro y sus hijos son personas particularmente abiertas, cariñosas, pacientes e interesantes, por eso no tengo ninguna duda en recomendar estos cursos a nadie. At the end of May I stayed in El Boalo, Madrid for an immersion course called “Spanish in Nature” (as it’s located in the heart of Guadarrama National Park, in the mountains). It’s been an unusual experience to me, the family that provided me with everything in their own house were amazing. 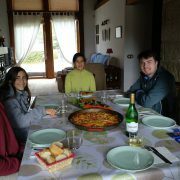 They’ve treated me like one of them, cooked delicious Spanish food and spent with me a lot of quality time. 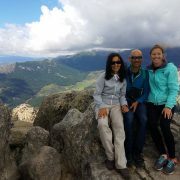 With the variety of activities I had every day (like participating in the local events, family life, hiking, rock climbing, swimming, cycling, visiting Madrid and Segovia and so on) it was impossible to be bored. To combine such entertainment with speaking Spanish all the time, to me, was the best way to acquire the language. Apart from that, I had 3 hours of proper classes every day. I’m surprised how one week of the course made me more confident speaking Spanish and not Spanglish. Esther y Álvaro en SPANISH IN NATURE. Eagle, Black Vulture, Black Redstart and a Cirl Bunting. En principio los dos días primeros fue muy difícil y cansado pero mejoré. Spanish in Nature está muy bien organizado. 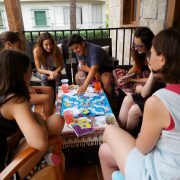 Yo disfruté con todas las actividades, me encantó practicar español en la mesa durante la cena con toda la familia, también fue muy divertido jugar a juegos de mesa con todos. Muchas gracias, ha sido una gran experiencia. Fue una semana perfecta!!! He mejorado el español y disfrute de todo mucho. Mi actividad favorita fue la canoa, especialmente con la familia de Esther, su hermano, sobrino y cuñada. También me gustó mucho Segovia, porque era muy bonita y relajada. El paseo por el Parque Nacional era hermoso y poder vivir las fiestas del pueblo fue muy guay. También me encantó que pudimos visitar Madrid y el rastro era muy divertido. Gracias Alvaro, Esther, Lucia, Amor y Javier. 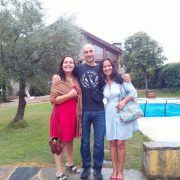 I spent the week of 21st of June to the 28th of June 2015 participating in the course EN CASA DEL PROFESOR, at the home of Alvaro and Esther. No matter what your level of Spanish may be I cannot recommend this course highly enough. 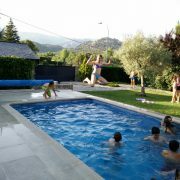 Initially it is quite daunting throwing yourself in at the deep end (no English is spoken, although all the family speak a high level of English), but after a while it’s no longer a challenge but enjoyable. All the family are more than willing to help you, and you don’t feel foolish when you make a mistake, you realise it’s part of the learning curve, and in time the mistakes become less and less. There’s no pressure whatsoever and you learn at your pace, and that’s a massive help and relief. The lessons seem to fly by and Alvaro’s a great teacher. The real learning however takes place outside the classroom, talking with the family, their relatives, their friends. The activities that are available are second to none, and nothing is too much for the family to arrange for you. 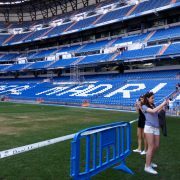 Madrid’s not too far an well worth a visit. To conclude, this course is well worth doing for so many different reasons, and when you leave you know the family will be your friends for life. I hope to return to do the course again in the future. Esta ha sido una de mis mejores experiencias de mi vida hasta ahora. Cuando llegas eres bienvenido con tanta amabilidad y te sientes como un miembro de la familia y mientras estas allí, eres un miembro de la familia. Estas inmerso al 100% y es verdaderamente el mejor metodo para mejorar tu español. Alvaro y Esther son grandes profesores y los niños hablan mucho contigo, todos tienen paciencia cuando pareces estar teniendo problemas con el idioma. No importa tu nivel de español, necesitas intentar esta experiencia. No te vas a lamentar, y aunque cuando llegues es posible que vas a sentir la relación de maestro alumno, cuando sales sabes que tienes unos amigos. Queridos Alvaro y Esther. Gracias por las dos semanas increibles, la gente muy simpática, muchas palabras nuevas y una cocina buenísima. QUIERO VOLVER ALGUN DIA!!!! Yo recordaré este verano siempre. Hola! 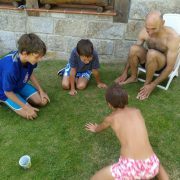 I spent a fantastic week staying with Esther, Alvaro and their children in July last year. They were extremely friendly, welcoming and, most importantly, great language teachers. Their home is within easy reach of Madrid but, at the same time, completely tranquil and very much in the Spanish countryside. I learnt tonnes of Spanish and even went to the local village evening meal where the locals bring their own cutlery and eat from a giant communal pot of stew! It was the cultural highlight of my Spanish trip! Having spent time in English-speaking countries, they know where anglophones are coming from in terms of language learning, which is important. Bueno, en pocas palabras, se lo recomiendo de todo corazon! It has been a while since me and my two children visited you and your language school. But we already have plans to come back. 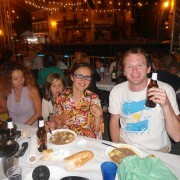 We have learned so much about the Spanish language, but also about your rich culture and Spanish cuisine. We felt very welcome and enjoyed all of the activities. 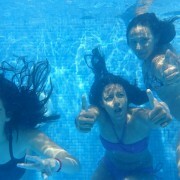 Wether it was in Madrid city, or the great Mountains or just swimming in the swimming pool. We are sure to come back and enjoy!!! 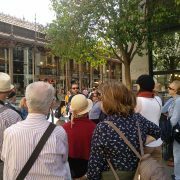 Desde que os visitamos no dejamos de pensar en el momento que volveremos a reunirnos con vosotros. Aprendimos mucho de la lengua, la cultura y la comida. 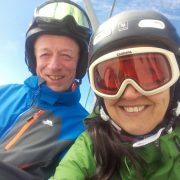 Nos sentimos realmente bien venidos y disfrutamos mucho de las actividades en Madrid y en la montaña. Nos veremos otra vez!! !